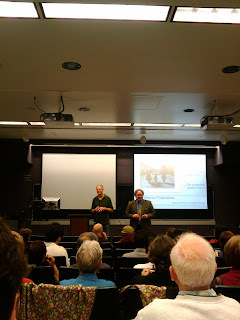 I had the pleasure of watching Frederick Marx's new documentary, "Journey from Zanskar" last night in one of the class-rooms in Taper Hall of Humanities (THH) at the University of Southern California. The documentary is about two Buddhist monks from the Zanskar region and their quest to take a about dozen kids between the ages of five and twelve from their village to a Buddhist school in Manali. The monks would like to educate the next generation in the Tibetan alphabet, so that they can learn the Tibetan Buddhist scripture and in doing so preserve their language, heritage, and culture. This fantastic documentary gives an account of how these kids along with the monks try to trek through one of the harshest terrains in the world. Zanskar is the northernmost part of the Kashmir region, and borders Tibet. It lies at an elevation of 13,000 feet, and for most of the year the region is inaccessible to outsiders. I won't give too much of the film away, but I will mention that Frederick Marx is an excellent film-maker and one can clearly see that this project is a labor of love. What I saw last night was a rough-cut of the documentary, but if that was Marx's rough-cut then I can only imagine what the finished product will look like. I took advantage of the beautiful weather in the morning and decided to go for a hike along East Canyon Road which takes one into the mountains surrounding Santa Clarita off of the 5 interstate highway. What makes for perfect hiking weather you ask? In my opinion, a bit of moistness in the air, a gentle cool breeze, and some precipitation, with sunshine breaking through clouds here are there. I drove along The Old Road and soon after I parked my car, I was walking along East Canyon trail. The hike was gorgeous and was perhaps the best hike that I have been on around southern California in a long time. Every trail has its own character, its personality - a bend here, a twist there, some beautiful wild flowers along the trail, or a big and wise oak tree sprawling its myriad branches in all of its beautiful glory. This trail was quite shady and was peppered with oak trees and pines when you reached the highest elevation which was around 2,700 feet. This was not an easy hike, but if you are in moderate shape, you ought to get to the top in an hour. There was no one on the trail which was perfect because I was seeking solitude and alone-time. Less than half an hour into the hike, the East Canyon trail forked into two - itself and Rice Canyon trail. I have not tried the latter, but from what I could make out, I am sure it would be a lovely hike as well. As I slowly, but surely made my way to the top, I came to another fork in the road. There was a trail called Weldon Road that would take me all the way down. If I had taken this road, I would have ended up farther away from Old Road on Coltrane Ave. There's an overpass on the 5 freeway that connects Coltrane to Old Road. Anyway, I continued on East Canyon Road for a while until it forked yet again, though this time it ended at a metal gate, but the land beyond the gate was private (apparently owned by some southern California Gas Company, as I was told by a fellow hiker whom I met on the trail). I was at an elevation of 2,750 feet, and there was not a soul around. I was surrounded by rain clouds, with the leaves of the oak trees wet, and dripping with water, and the trail underneath my shoes getting muddy. I felt as if I had been transported to another world. The whole scene up there was eerie and mystical. I continued a bit further on Sunshine Motorway as supposedly it afforded a beautiful view of San Fernando Valley and the 118 freeway. However, it was so foggy, and the rain clouds so dense that I couldn't see much and so I decided to head back down. I have always equated hiking with meditation, and it was so serene at the top of Santa Clarita mountains that on my way down I felt content and full of joy. I highly recommend this hike, and if you have some free time over a weekday, there's nothing like spending time on a trail with a friend or a loved one. The picture that you see on the left is the one I took at the start of the trail-head where I parked my car.